At the end of April, the 40 Days to Personal Transformation program began at Yoga Bhoga (a Portland yoga studio). This program follows the principals and laws Baron Baptiste presents in his book 40 Days to Personal Revolution. Through meditation, yoga, journaling, weekly meetings and diet changes the participants of the program move on a journey of self-exploration and self-awareness. By becoming hyper-aware of oneself, we bring to the surface buried emotions, thoughts, habits of avoidance, denial, and self-sabotage. Only from recognizing these behaviors, are we then able to remove them, to change our patterns, in order to find a place of ultimate joy. B.K.S Iyengar said “Asanas penetrate deep into each layer of the body and ultimately into the consciousness itself.” In yoga classes, asana refers to the postures but asana literally means “seat.” In the 40 days program, we are asked to find a seat within ourselves and begin to observe who we are. By sitting with ourselves, listening to our thoughts, witnessing our reactions to daily life, we allow our bodies and minds to feel both the positive and negative emotions within us. As I begin to root down into my internal seat, mindful to the moments of my life, pleasant or not, I am little by little beginning to remove my layers, slowly exposing the consciousness I long ago hid from myself. The idea of transformation is not about changing who I am or looking to become a new person but rather it is about removing what binds me to discover who I already am. In this program, a component to restoring mind, body, and spirit involves going through a 3-day cleanse that consists of eating only fruit. The first day I was surprised to find I was neither uncomfortable nor hunger. I felt good eating fruit salads and I discovered that the addition of mango slices made each meal a special treat. On the second day I woke up to a headache…and a fuzzy mouth. As the day progressed, I found myself craving almonds and thick chunks of sourdough bread with melted butter. I was mildly surprised that I did not crave more luxurious foods…or even full meals. More importantly, on the second day, I painstaking came to understand the weight loss I desired from this fruit cleanse is not from losing water weight but from the metaphorical shedding of emotional layers due to the lack of distraction brought on by comfort food, alcohol, and caffeine. Do You Mind? If Not, What Do You Miss? 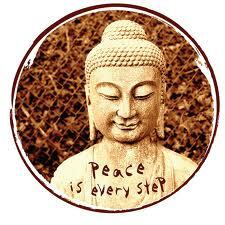 Right now I am absorbed in Thich Nhat Hanh’s book Peace Is Every Step. The book is full of quick anecdotes, stories and meditations (no more than 2 pages) that invite the reader to tune into their breath and become aware of their own body, mind, and how they interact with the people and environment around them. I find that each entry has a perfect place for every day. I try not to read more than 3 passages a day…and often, needing to process the the words a bit deeper, I reread what I read the day before. In “Eating Mindfully,” Nhat Hanh discusses the importance of sitting to eat without distraction; being mindful of not only your food but also those who you share this meal with. I began to think, by turning on the TV, by distracting ourselves with outside stimulation, rather than sitting at a table, face-to-face, sharing a meal, what is it that my husband and I avoiding? Are we avoiding each other? Are our lives so hectic that we escape to the artificial world rather than tuning into ourselves and each other? I am not afraid that my marriage is failing nor do I feel that we are in a bad place. I just wonder what aspects of our relationship are we not nourishing because we tune each other out just as we tune out the food we eat, the air breath, and refuse to let our minds settle on our breath. On a larger scale, how does this behavior translate into relationships I have with friends, families, students and acquaintances? As I ponder these question in my own life, I ask YOU: How does your behavior affect both you and others? What do you miss by mindlessly distracting yourself from being completely present?